With intimidating confidence, this lovely fairy gazes out at those in her path, standing in the moonlight let in by the rose window. 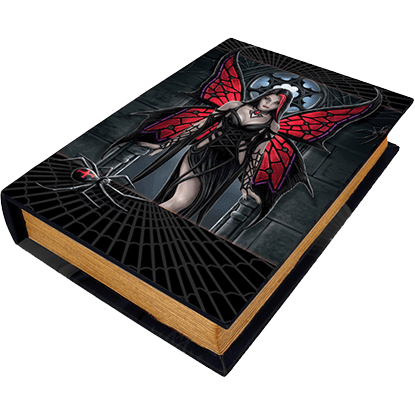 The Aracnafaria Book Box features this popular gothic fantasy print by artist Anne Stokes on front. The Aries Fairy Trinket Box makes the perfect gift for anyone born under the sign of Aries, which runs from March 21 to April 20. 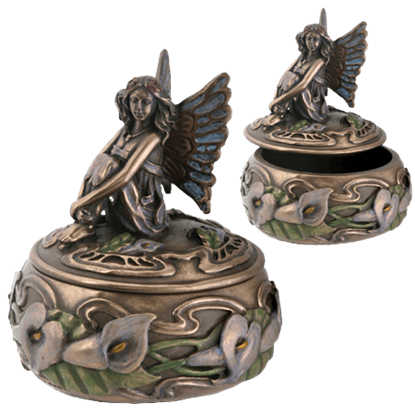 A fairy rests serenely on the lid of this decorative box, and the base features a green Aries symbol. The fairy holds a multitude of white blossoms to her chest, eyes closed in a serene expression of bliss. 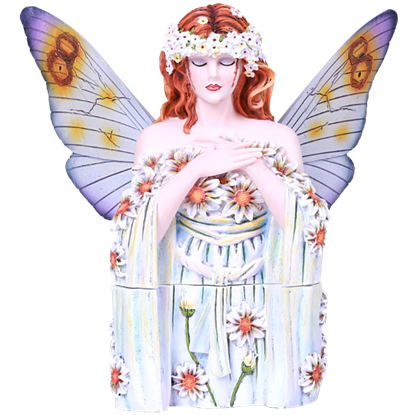 The Bliss Fairy Trinket Box is a beautiful fairy accent that looks like a statue yet hides a small storage compartment within. Pixies and fairies of all sorts are associated with nature, and this one is no different. 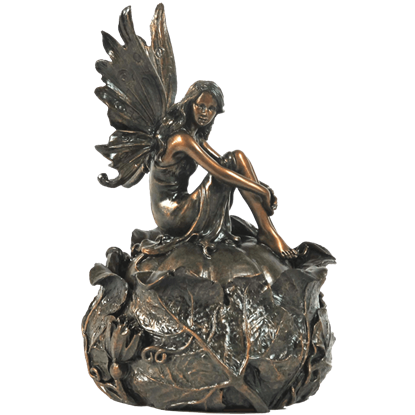 However, this Bronze Fairy on Squash Trinket Box hides a secret, and that makes her a wonderful guardian for all of your trinkets. The Butterfly fairy box gets its name from its conservative, yet elegant design and decoration. 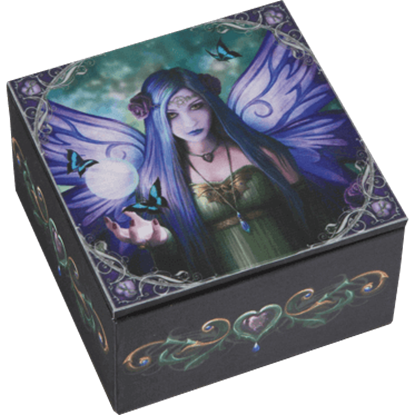 The decorations on every side of the box contribute to the butterfly portion of the name, and the fairy on top make it a fairy box! The Call Of The Wild Stump Box is more than a container for storing your trinkets and knickknacks. 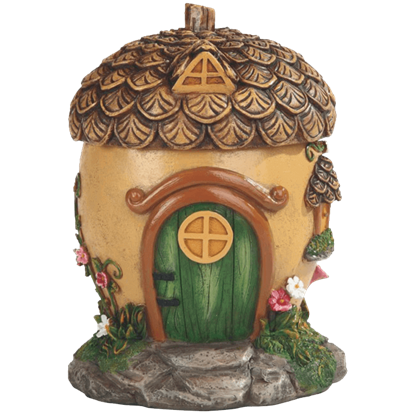 It is a decorative piece that is equally at home when used as a decor item to add that touch of fairy fantasy to any room. 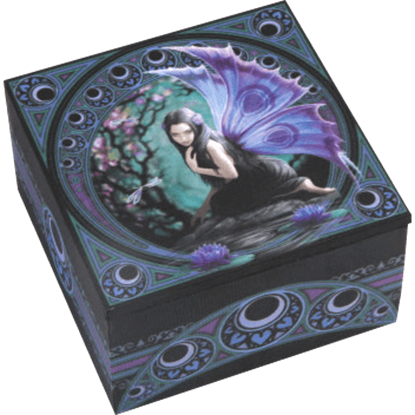 All your trinkets and belongings will be kept safe in the Calla Lily Fairy Box, where they will rest safely and snugly beneath the seat of a vigilant and ever-watchful fairy guardian, whom spends her days sitting eagerly on the lid. 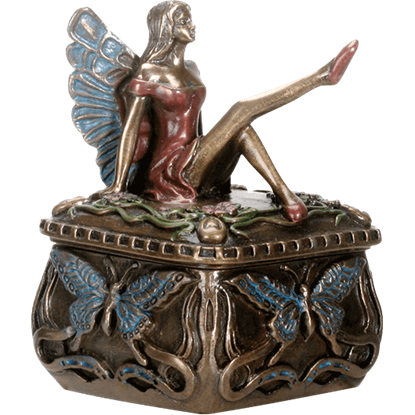 The Cancer Fairy Trinket Box makes the perfect gift for anyone born under the sign of Cancer, which runs from June 22 to July 22. 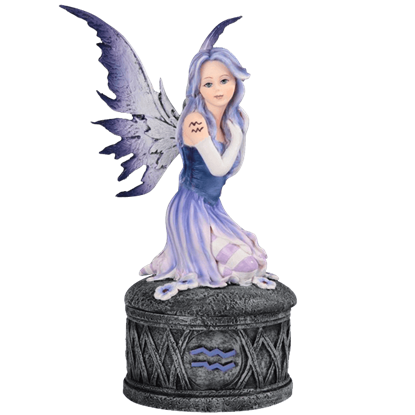 A fairy rests serenely on the lid of this decorative box, and the base features a pink Cancer symbol.